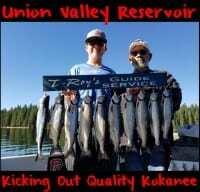 Sockeye season opened Wednesday here in the Wenatchee area and our kokanee on Lake Chelan are starting to be ignored. 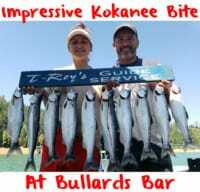 However, the kokanee will still fish good for another few weeks and there won’t be much pressure. 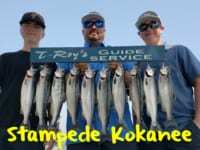 Most of the guys are going to bounce over to the Columbia River and fish for sockeye. Right now the kokanee are in the lower lake. You are going to find the fish in the shallower sections of Lake Chelan. They’ll be towards the town of Chelan. Any of the shallow basins will be holding them. They’ll be anywhere from 15 to 50 feet deep, whereas a few months ago we were catching them 135 feet deep. This time of year when I’m running my downriggers I’m running them from 20-50 feet down over 200 feet of water. Lake Chelan is different than many kokanee lakes. Our kokanee are shallower now than they were in the spring because the plankton has moved shallower. It’s all governed by water temperature. Most lakes kokanee move deeper as water warms. On the other hand, always move shallower in the summer here. Once you find them they’ll be in big schools. You’re fish finder just lights up. As the water warms up the fish are going to start to migrate up the lake, but right now they’ll still be available. There’s still some real nice fish out there. They have beautiful meat still. They are getting bigger and flatter daily. The fish are running from 12-16 inches. Anything bigger than that is going to be few and far between. Last time I was working the lake we had 50 kokanee by 11am. It’s a blast and I wouldn’t imagine the next two weeks are going to be any different. Gearing up for kokanee is a lot like our sockeye fishing. I’m running 6-inch Sling Blade dodgers with Free Drifter flies that are tipped with Fire Corn. I always run contrast when I’m kokanee fishing. If I’m running an orange hoochies I’m running pink Fire Corn. I’m running the opposite color of corn than I’m running terminal tackle. I think the kokanee like contrast. I do the same thing sockeye fishing and it seems to make a big difference. It gives it a little more pop. Editor’s Note: Anglers may keep 10 kokanee per angler, per day. Brad Wagner runs Bobber Down Guide Service. 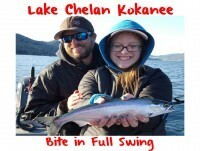 For more info on his Lake Chelan kokanee trips please visit http://www.fishwenatchee.com.